4/18/2000 I enjoyed surfing your site, and I am sure everybody else will too. Your site is Close to a Silver. 5/04/2000 Congratulations Venturing Crew 369!!! 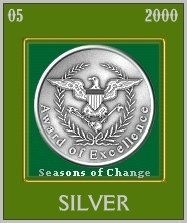 Your site has been chosen as a winner of The Seasons of Change Silver Award for May 2000. I enjoyed my visit to your site. Thanks for making the web a better place. It is evident that you have put a lot of hard work into your web space. 5/04/2000 Dear Venturing Crew 369 It is my pleasure to congratulate you on achiveing the "Scouting Award of Online Excellence" Our Judges have viewed your web site, and they have decided, that your site is a great example of upholding the Scouting traditions, and ideals on the world wide web. Proudly display the "Scouting Award of Online Excellence" on your site, you deserve it!!! 8/19/2000 In recognition of creativity, integrity and excellence on the Web. Congratulations! Your web-site has been reviewed and chosen to bear the 2000-2001 Golden Web Award. 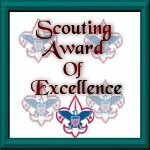 You have been selected as the winner of the Scouting Award of Excellence for the week of September 2, 2000. Please continue to stand stall for the world wide community of Scouting.